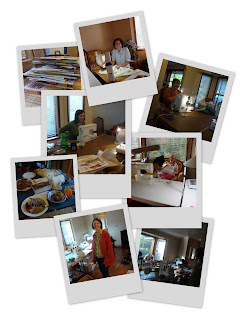 Instead of our usual monthly meeting at Stitches, yesterday the Seattle BurdaStyle Club held an all day sewing retreat. One of our members kindly volunteered her mom's home for the event, and eight of us got together for nearly 12 hours of sewing, in addition to plenty of chatting, and snacking too. It was raining like crazy on Saturday so it was the perfect day to stay inside and sew. Coats and jackets were the most popular item - Vineta started an incredible blue wool coat from Vogue, Amy nearly finished a fall coat from McCalls, and Cheryl traced, altered and cut Burda 10-2009-109, which really piqued my interest! Diana and Cheri both worked on woven shirts, and Stephanie mastered the blind hem on her new machine. Plus we had a special 8-year old guest who sewed up her first garment ever, a pair of leggings from Ottobre. They turned out fantastic, that young thing has a bright sewing future ahead of her. I eased into the day with a pair of easy yoga pants, a BWOF pattern I've made before, and then I finished the jacket with the Carolina Herrera fabric I mentioned in my last post. Pics and reviews to come as soon as I get them photographed. All in all it was a fabulous day and we all want to do it again, soon! It sounds like a fun day. What can you do better than sewing on a rainy weekend!? What a fun day! Sewing with like-minded people and good food. What could be better? Sorry I missed the event! I was watching my son's soccer team warm up in the big storm -- only to have the game cancelled when lighting apppeared! I have been working on Halloween costumes and capes. That Burda coat looks like a fun one to sew! Oh how kewl! I'm sure that alongwith the friendship and sewing everyone was inspired, relaxed and their creative spirits were fed! Glad you all had a great time and thanks for sharing it with us...btw, I can't wait to see the CH jacket! It looks like fun--I'm sorry I couldn't make it. What a fun day! Wish I was in Seattle. It was so incredibly fun! I wish we could do it more often. A big thank you to you and Diana for organizing the event. I'll post the handful of pictures I took later on today. Your jacket turned out really, really nice. That fabric is to die for! Just too much fun! I bet you came home so inspired. Nothing like sewing with friends, our retreat is Dec 2-6 I can't wait. How'd you get your pics on your page like that? 8!!?? what a great turnout!! way to go girls! I am sure you all had a great time! With twelve hours of sewing I bet you had to wind your bobbin a lot of times! That does sound like fun. I'm lucky if I can find two hours to string together to sew! By the way, I'm a new reader of your blog, but I like it already! Also, is that a Butterfly Gold Corelle plate I spy on the table? That's the same pattern my aunt uses!